Home » Blog » INWED 2018 Part Two: What do you like about your job? INWED 2018 Part Two: What do you like about your job? For International Women in Engineering Day 2018, we spoke to Francesca Gaylor and Jamie D’Arth from MBDA, Kerry Knight and Victoria Roots from BAE Systems, and Jenny Smith from Aeromet about how they got into engineering. Here they share what they like about their jobs. Kerry Knight, Mechanical and Electrical Fitter for BAE Systems Maritime Services, is part of the team who designed, manufactured and tested the Pacific 24 Rigid Inflatable Boats that are on the giant aircraft carrier HMS Queen Elizabeth. With top speeds of up to 38 knots (44mph), the RIBs are versatile rapid response craft which can be deployed from either ship or shore. 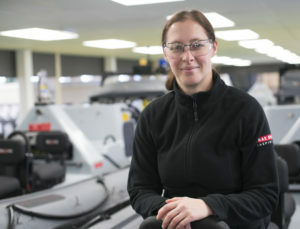 Jamie D’Arth, mechanical engineer at MBDA, said: “I’ve always enjoyed STEM subjects. I found the logic of maths and physics very interesting, and with chemistry it was just fun in general. After the mobile robotics show MBDA opened my eyes to the opportunities within engineering, and how they aligned with my wider interests. Find out more about International Women in Engineering Day. Find out more about career opportunities at BAE Systems, Aeromet and MBDA.